Manscorpion Tark explains that he and Najka were created by their master, who has long since disappeared. This implies that Tark and Najka are the result of experiments, similar to the Duke's Dear Freja, possibly sharing the same creator. Tark was born of the misdeeds of an ancient being. He and Scorpioness Najka, once had a master who created them both long, long ago, so long ago that nobody now remembers when they were born or where their master has gone. Both Tark and Najka were human once and betrothed to each other. They would always be found at each other’s side, but as time went on, things went awry. Najka was a frail soul, and she soon succumbed to madness. She became violent, raging uncontrollably. Eventually, she came after Tark, and they have been locked in combat ever since. Tark asks that you help him kill his betrothed. The wounds they exchange are never lethal and they are at a standstill, waiting for someone to tip the scales. Tark does not appear to know any sorcery or magic and instead relies on his stinger in combat. He will grant the player this weapon, which inflicts heavy poison damage, after they have defeated Scorpioness Najka, almost as if he does not need it anymore. It is possible that Tark and Najka’s master was Seath the Scaleless himself. Their master was born with a fatal flaw. He resented those who had what he lacked, and became fully mired in hatred because of it. He was a tragically lonely soul, and this solitude eroded his very reason. Eventually, his desire and hatred drove him mad. It was at the peak of this madness that he created Tark and Najka. But, in the end, he never understood what it was that he truly lacked. While their master may have been Seath, it is interesting to note that Seath’s creations often related to crystallisation or rebirth. Seath sought the scales of his everlasting brethren for himself so that he might gain immortality. He was born with a fatal flaw, and resented those who had what he lacked, eventually driving himself mad. In many ways the story of Tark and Najka’s master connects with that of Seath. However, the existence and attributes of Tark and Najka themselves seems to indicate that they were created by a different hand. Neither of them are related to crystals, and while Najka may somehow be construed as having a relation to the Piasca or rebirth because she is a woman, her fate seems very different. What is very interesting about Tark’s dialogue is that he speaks of his master as a tragically lonely figure. We know that Seath (apart from his Channelers) likely was a tragically lonely figure, but this hardly seems to be something that defines him. The loneliness and solitude of their master is clearly linked to the erosion of his reason, so it seems that what their master lacked, was companionship. This observation becomes more striking when we realise that Tark and Najka were betrothed. They were most certainly a couple who were romantically involved, and their master was tragically lonely, mired in solitude. With these connections, it seems possible if not likely, that their master was simply another form of Seath’s soul, who was obsessed with companionship. Whatever the case, Tark will tell us that we have defeated their master after killing the Duke’s Dear Freja, but end on the ominous note that their master never dies, only changes form, so that he may seethe for all eternity. Tark and Najka are creations of Seath or whomever posses his soul. The official guide even states "The product of a twisted experiment in a age post past". Tark is Black Iron Tarkus and Najka his Companion. Tark’s past is a thing obscure, and he only remembers his name… Tark. He and his companion Najka were born of ancient misdeeds. Tark favours physical combat, while Najka is adept at sorcery. It is likely that Black Iron Tarkus made it to Anor Londo, as he is the only one to offer the Chosen Undead assistance in overcoming the Iron Golem. His armor is then found on a body in the great cathedral housing the Painted World of Ariamis. It is possible that Tarkus set out with his betrothed Najka, a team that could utilise great physical strength and powerful sorceries to overcome any obstacle. Upon reaching Anor Londo, Tarkus could have been captured by Seath himself and both he and Najka taken to the Duke’s Archives, then experimented on and transformed into the beings we encounter. Tark mentions a being with powers similar to theirs who took the form of a spider, but doesn’t know where it disappeared to, speculating it was seduced by madness. This description both fits Chaos Withc Quelaag and possibly the Duke’s Dear Freja. If referencing Quelaag, then it may be a strong hint of Tark’s origins and therefore Najka’s as well. 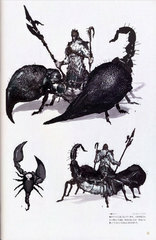 It is interesting to think of their dynamic; Najka a frail soul, and Black Iron Tarkus, gallant and capable. Tarkus would likely have defended Najka in their search for a cure to the curse (which Najka most probably had, considering she succumbed to madness) only to be captured and have that role somewhat reversed, when he is forced to admit that he must kill his betrothed if she is to be at peace. This is no place for you. Be gone. Those who do turn back when they see me. Or make an attempt on my life. We once had a master. He created us long, long ago. But he was born with a fatal flaw. He resented those who had what he lacked, and became fully mired in hatred. Eventually, he drove himself mad. It was at the peak of this madness that he conjured up we strange creatures. Our master was a tragically lonely soul. Eventually, his solitude eroded his very reason. …what it was that he truly lacked. Nobody knows when we were born. Or where our master has gone. The only ones who even speak a human tongue are myself and my better half. I wish to ask a favour of you. I want you to kill my betrothed. Once, I always found her at my side. But as time went on, things went awry. She became violent, raging uncontrollably. Eventually she came after me. And we've been locked in combat ever since. We seem to be at a standstill. The wounds we exchange are never lethal. I was born of my master's madness. Perhaps this is some curse. I will be sure to assist you in return. You've defeated my better half. This is my thanks. Take it. Long ago, there was a being with powers similar to ours. The creature took the form of a spider. But I don't know where it disappeared to. Perhaps it was seduced by madness. What skill. You've defeated my master. But our master never dies, only changes form, so that he may seethe for all eternity. Brave human, you have yet to face your greatest perils. Take these. May joy await you at the end of your travels. I have no gods to pray to. But still I pray that your journey will be safe. The mad will never be forgiven. The product of a twisted experiment in a age post past, Tark's body is human above the waist and scorpion below. While is terrifying appearance unilaterally scares away most visitors or misleads them into assuming he is a monster and attacking him, in actual fact Tark is a respectable and upstanding person who apparent loneliness is more than understandable given his circumstances. Tark resides in the Shaded Ruins and originally lived with his wife Najka, a female human-scorpion born from the same experiment as he. Najka's transformation, however, had rendered her mind fragile and unstable; she gradually went insane and ultimatum developed into a raging beast. Manscorpion Tark's thrusting sword. The scorpion pincer guard contains poison, which is injected into foes pierced by the blade. Tark's past is a thing obscure. But then again, do any of us know who we are, let alone what we may have been?